“The sky invites me; the earth devours me.” As the gentle bass throb springs beneath a tom-driven beat, a glowing lead appears drawing sentimentality in primitive, though effective, gestures. Justin Broadrick sums up the separation of soul and body over the six-something minutes of the title track, which marks the halfway point in Broadrick’s fifth LP as jesu, the lengthily titled Everyday I Get Closer to the Light From Which I Came. His mortally thematic and existentialist musings run their course through Everyday, this album, in some ways, being the creative sum of life happenings. As Broadrick has recently been working on a new album with his newly rejuvenated previous band, Godflesh, he’d also apparently become a father before he’d begun to work on this new jesu album, a circumstance that affects much of its tone. 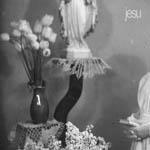 jesu provides Broadrick the perfect platform as it is his pop project, the thing that allows him to engage in studio trickery and melody, emotionality and hooks. In some ways it would be simple enough to state that Everyday “is what it is:” the manifestation of a sensitively realized representation of Broadrick that finds some opposition to the otherwise grim and aggressively industrialized vision prevalent in the discography of Godflesh. While Godflesh is a metronome of persistence and forever held to its foundation with no threat of losing balance, jesu is delicate. In spite of Broadrick’s ample distortion and momentary lapses into amplified down strokes, it would be easy to liken his work to Phil Elverum (Mt. Eerie) and Ben Chasny (Six Organs of Admittance), light and airy folk-bred output that’s occasionally trespassed into derivations of the metallically inclined. And then, of course, there are certain textures and tones that bring to mind Kevin Shields and Sigur Rós, those warming and immersive blankets of sound and vocal melody that Comforter employs as notes prance or alight on its surface. And though Comforter’s softness is eventually charred once distortion is introduced, the song lightens some of the exterior that underpins Homesick, a driving and emotional sonic endeavor that’s both sentimental and aggressive in its stride. Despite its core, the song has an acute stomp that sounds abrupt next to the otherwise fluidity of the music, creating this dichotomous interaction that sounds pretty but also uncertain. At almost 18 minutes, The Great Leveller is this balancing act of composition and metal-spirited nuance that’s introduced by piano strokes and drum corps styled snare rolls which later transition into droning, sludge-bred quaking guitar riffs. Broadrick’s voice shrouded in autotune, his melodies drone in robotic contrast to the music’s rather fuzzy charge. The second half of the song grows from a simple drum and guitar combo into something more instrumentally involved, elements emerging and heightening the music’s impact. The piano keys follow the guitar strings while bowed instruments carve fluid lines through the song’s volume. The obligatory opus is checked off. The album ends with the instrumental Grey is the Colour, an almost slacker-borne strum of guitar conveying some sense of contentment. Though the track is as colorless as its title, Broadrick’s passion is still appealing and factors heavily in the success of Everyday, his honesty more engaging sometimes than his mode of conveyance, the voice having saved the album from being a reason to wallow as opposed to listen.